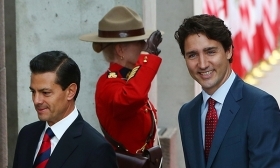 Mexico President Enrique Pena Nieto, left, and Canada Prime Minister Justin Trudeau have spoken to Donald Trump about the new U.S. president's objections to NAFTA. OTTAWA/MEXICO CITY/WASHINGTON -- President Donald Trump put neighboring Canada and Mexico on notice: He’s determined to wring out more favorable terms from NAFTA. Now comes the hard part of reworking a trade deal that’s framed relations for more than two decades. Trump’s plan to re-negotiate the North American Free Trade Agreement was received in Mexico with a call to protect tariff-free trading, while in Canada officials seemed more worried about avoiding unintentional damage to the economy as the United States targets Mexico. The U.S. president has broad powers to implement trade policies. While Trump has given few details about exactly what he’s seeking from a NAFTA re-think, it could be a long and potentially messy process. White House spokesman Sean Spicer on Monday said Trump plans further talks about modifying NAFTA at meetings with the two leaders in the next 30 days. How discussions unfold will determine the way forward, including if piecemeal reforms are possible or it will require starting over, Spicer told reporters in Washington. Canada’s strategy, at this stage, seems to be to get out of the way. Canadian officials are holding out hope they’re not Trump’s target, and will do everything they can to make sure they don’t get sideswiped if the president goes after Mexico. On his first post-inauguration call with Trump on Saturday, Trudeau reminded the president that Canada is the top buyer of U.S. goods overall and the top buyer for 35 individual states. Trudeau has also assured Trump that Canada won’t be one of the 1,000 problems he’ll deal with daily. Canada nonetheless expects Trump to pursue large-scale NAFTA changes, according to a person familiar with the talks so far. Canada shouldn’t be “enormously worried” because it’s held in high esteem and two-way trade is balanced, Stephen Schwarzman, chief executive officer of Blackstone Group LP and a Trump adviser told reporters on Monday after speaking to Canada’s cabinet at a retreat in Calgary. Pena Nieto is striking a bolder tone. On Monday, he laid out 10 goals for his government in upcoming negotiations with the Trump administration, including ensuring the free flow of remittances and seeking any return of Mexican migrants to be orderly. He said NAFTA should remain free of all tariffs. The U.S. president typically has far-reaching latitude over trade policy, with powers strengthened in 2015 after passage of legislation granting the president fast-track trade-negotiation authority, in conjunction with the proposed Trans-Pacific Partnership trade deal that Trump on Jan. 23 withdrew the United States from. That same authority can now be used by Trump to renegotiate NAFTA and submit the new pact to Congress for an expedited, up-or-down vote without amendments. There’s no formal provision built into NAFTA to open it up for re-negotiation, said Chad Bown, who advised former President Barack Obama on trade and is now a senior fellow at the Peterson Institute for International Economics in Washington. Trump would have the ability to trigger an article within NAFTA that allows a party to withdraw six months after giving formal notice to Mexico and Canada, along with Congress -- though Trump hasn’t suggested he’ll go that route. It could take months, or more likely years, to hammer out new terms even after political leaders give their go-ahead and the negotiating teams are assembled. Trump is still waiting for his trade team to be firmly in place. Wilbur Ross, nominated as Commerce secretary, said at his Senate confirmation hearing last week that retooling NAFTA would be an early priority and everything is on the table. As with Ross, another key player who’s not yet confirmed is U.S. Trade Representative nominee Robert Lighthizer, a former trade negotiator in the Ronald Reagan administration. Fellow China hard-liner Peter Navarro will head the newly created White House National Trade Council. Typically, countries that want to update a trade agreement begin with an exchange of letters, said Carlos Vejar, a lawyer at Holland & Knight in Mexico City who previously worked on NAFTA issues and trade disputes at Mexico’s economy ministry. The nations then agree to an agenda of topics and set a schedule for negotiating rounds rotating among the countries involved. Trump hasn’t been explicit on what he wants to change. With his inauguration-speech goals of “Buy American” and “Hire American,” two big targets for negotiation may be procurement and the auto industry. Trump might want changes that effectively boost the share of auto manufacturing in the U.S., either with specific provisions for more American content or by tightening rules-of-origin requirements that would limit content from outside of North America. Also, any new deal could curb the ability of Canadians and Mexicans to bid on U.S. government contracts, a shift from NAFTA’s provisions. “The bigger piece will be the renegotiation of the procurement chapter,” said Sarah Goldfeder, a principal at government relations firm Earnscliffe Strategy Group in Ottawa, who has served as special assistant to two U.S. ambassadors to Canada. Trump’s team could also seek changes to the investor dispute settlement system to limit the ability of Canadian or Mexican companies from suing the U.S. government, a change that’s unlikely to garner much opposition from the two partners. Ross, in a written responses to questions from Democratic Senator Bill Nelson of Florida released on Jan. 23, said “issues of concern” for NAFTA include rules for country of origin and dispute resolution mechanisms.